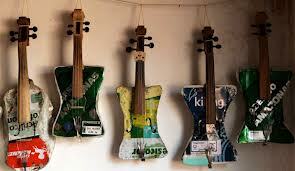 Several of these Feel Good Friday posts have been focused on people making art from trash. Well this week, trash becomes music. In the town of Cateura, Paraguay, most residents earn their living sorting through the trash and selling the bits that can be recycled or reused. 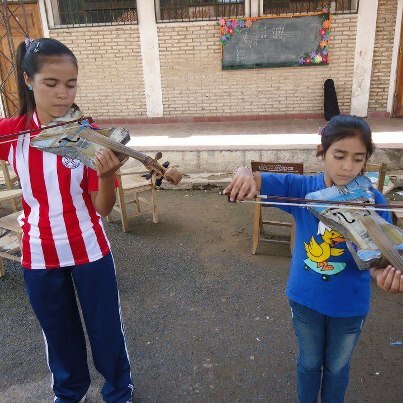 They also pull out parts to make musical instruments for the local children who play in "The Recycled Orchestra". 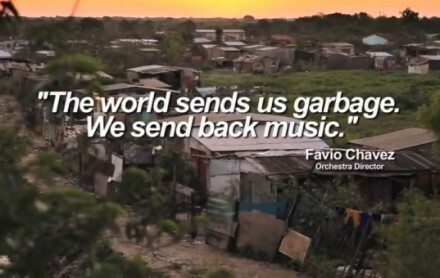 I encourage you to watch the trailer for Landfill Harmonic, a documentary film in production, that follows the stories of a few of the children in the youth orchestra. It's 3:27 minutes long and will make you want to a) dig out that musical instrument you've had in your garage since 5th grade to see if you can still play it, b) pull bottles and cans out of your recycling bins to build a drum set and c) keep an eye out for the release of the film. If you thought the story of the boy making windmills in Malawi made you cry, I'm just warning you now, you might want to have a Kleenex handy. Enjoy it? Well then, share this link with your friends, post it on your Facebook page, "like" Landfill Harmonic's Facebook page and start checking the movie listings in 2014 so you can be the first on your block to see the film. If you've got ideas for other projects, people or groups you'd like to see mentioned in a Feel Good Friday post - send me a message and let's make it happen!